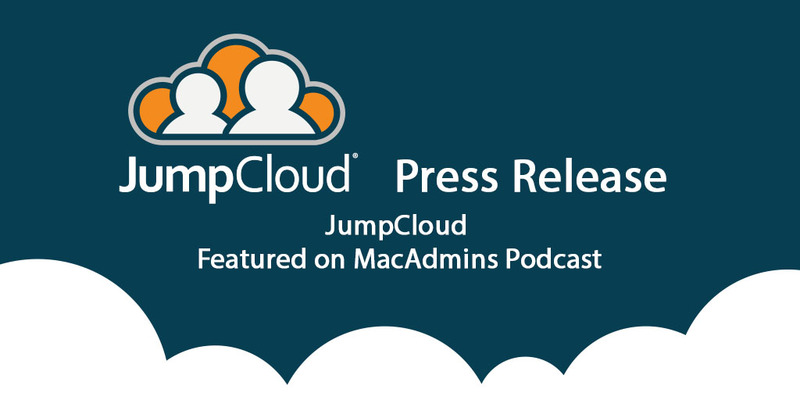 BOULDER, COLO. – August 1, 2018 – JumpCloud®, the first Directory-as-a-Service® platform, today announced it’s feature on the MacAdmins podcast, a go-to for IT information regarding all things Mac®. JumpCloud CPO, Greg Keller, was a guest of the show, and talked about how JumpCloud has solved recent issues regarding Secure Token and FileVault® in Apple®’s recent High Sierra update. MacAdmins is a podcast by Mac admins for Mac admins. The podcast itself is bimonthly and hosted by MacAdmins.org, a Slack community for Mac admins. The show features hosts such as Tom Bridge, Charles Edge, and more who discuss Mac systems and the effects they have on the IT industry with a variety of special guests. In Episode 88: secureToken, JumpCloud, and the Hunt for the Great White Whale, Tom and Charles discuss the problem of macOS High Sierra Secure Token with JumpCloud CTO, Greg Keller. In this episode, Greg and the MacAdmins hosts talk about how JumpCloud’s Mac Agent, through the help of some keen engineering, has enabled new users to be assigned a Secure Token remotely. When High Sierra’s new update was released, new users had to be created manually on each machine to create a Secure Token, which links the new identity to FileVault to increase and ensure overall data security. While it seems menial, for many IT admins who use APIs to create users remotely (or leverage legacy IAM solutions such as Active Directory®), the new change resulted in quite the hassle and a directory service that didn’t work with Macs. Thanks to JumpCloud, however, IT admins no longer need to worry about issues involving Secure Token not being enabled for a user. For Mac users, JumpCloud also recently rolled out a macOS app, designed to revolutionize Mac user password management. You can learn more about it here.